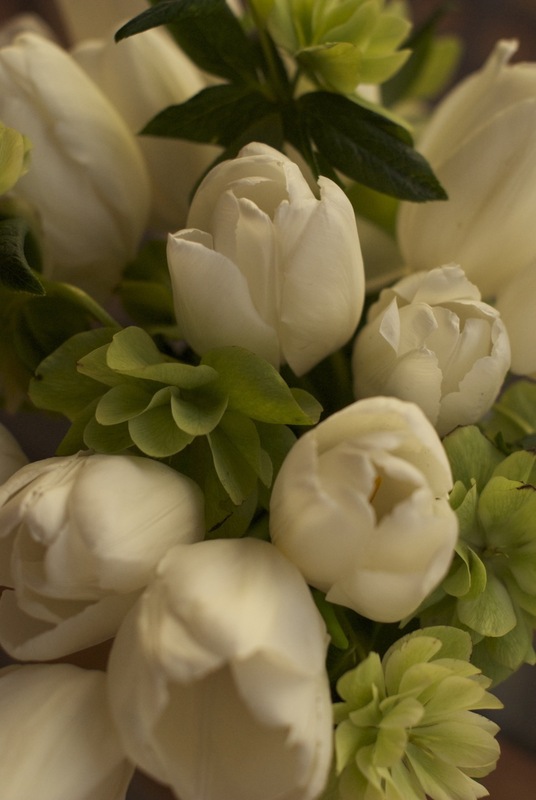 My first garden bouquet for the spring is this of Tulipa ‘Hakuun’ and an unknown hellebore. 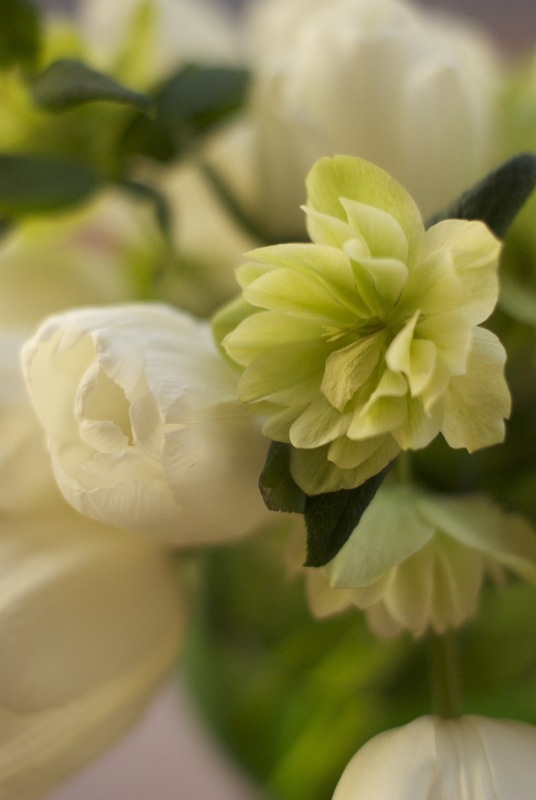 I love the shades of white and light green with the deep green vase. My inspiration for making the bouquet was a brutal wind that was blowing. I decided to rescue some of my favorite tulips and bring them inside to enjoy. Along the way, I decided the hellebore blooms would look lovely with the tulips. Once the wind stopped, I decided to photograph the bouquet outside with the soft setting light. I am enjoying this bouquet and want to thank in particular, Cathy at Words and Herbs for her ongoing beautiful bouquets that have motivated me to start taking photos of my bouquets, and to even participate in this fun meme. Have a wonderful week gardeners! A beautiful first vase…I love the white and green and especially photographed in the setting light with the reflections…stunning my friend. 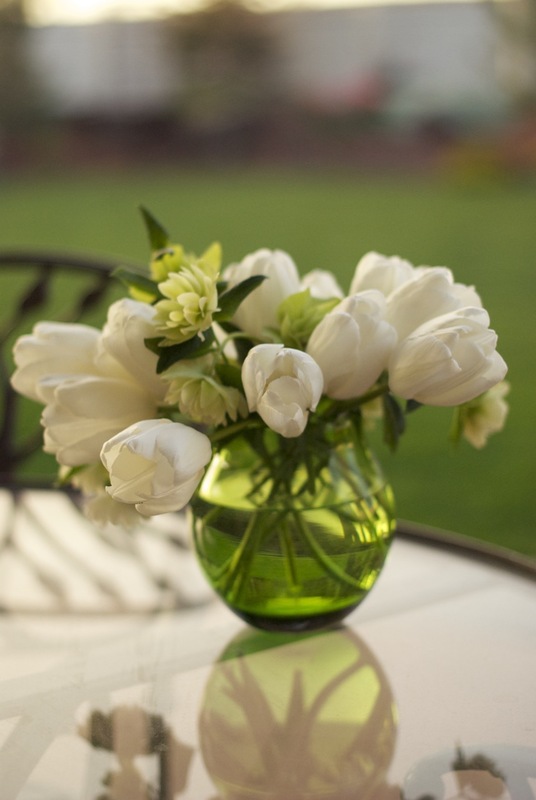 This is a really pretty bouquet Andrea, I love green and white, your glass vase looks perfect too. Really lovely! Can’t wait to get some blooms in my yard too. Or time to go enjoy them. That is so beautiful! The kind of vase that makes you sigh contentedly when you see it! 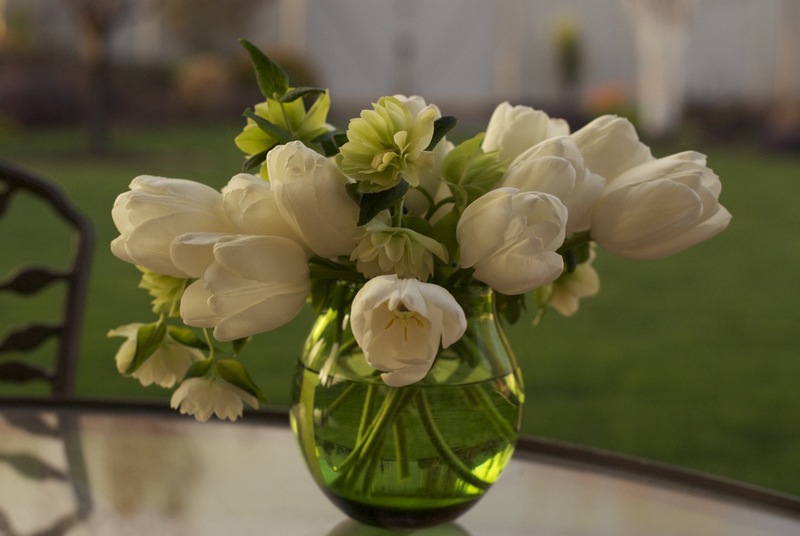 White tulips and hellebores complement each other so well, and I love the green vase as a contrast too. Thanks for the mention Andrea, and I am so glad you joined in this week! Same to you Yvette ~ Happy Spring! What a debut! Elegance personified. A very elegant white tulip.